Maine taxi accident lawyers at Hardy, Wolf & Downing are well-equipped to handle injury claims involving yellow cabs, livery cabs, limousines, party buses, airport shuttles, and water taxis. If you or a loved one have recently been injured in a crash involving a taxi, limo, shuttle, or transport vehicle, you can call 1-800-INJURED for a free consultation to see if a taxi accident lawsuit might be your best option for obtaining monetary compensation for your losses. Portland, Maine is known for being accident-prone. “We have a lot of tricky intersections and a lot of aggressive drivers,” the city’s transportation systems engineer Jeremiah Bartlett told the Portland Press Herald. The city tends to see a lot of commerce and tourism traffic from outside the region as well, which means more people driving who aren’t familiar with the roads. Yet, even seasoned drivers who cruise around town for a living can make mistakes that result in broken bones, burns, amputations, paralysis, traumatic brain injuries, and wrongful deaths. Based in Portland, Maine, our car accident attorneys have been securing fair and just settlements & jury awards for injured clients since 1976. Learn more about our impressive track record, and have all your questions about your legal options answered by contacting us for a no-charge, no-obligation consultation. Working with a qualified attorney specializing in taxi accident lawsuits will ensure that your case gets taken seriously in court and that you receive the maximum possible compensation allowed by law. Much can be done at the site of an accident that can aid in a taxi injury lawsuit. Get names and contact information of all witnesses who saw the accident occur. Take photos of the damage and accident scene before anything is moved. Take photos and seek medical attention for your injuries right away. Call the police to file an official accident report and request a copy for your records. Request a free consultation with experienced taxi accident attorneys at 1-800-INJURED to explore your options. Maine is considered a “fault” car insurance state, meaning that the driver who is determined to be “at fault” must pay for all damages and injuries. In our state, you can file a claim with your insurance provider, file a claim with the other driver’s insurance company, or file a personal injury lawsuit. When it comes down to another person’s word against your own, it helps to have legal representation from a taxi accident lawyer. Legal counsel can look into the incident to determine if drugs, alcohol, speeding, fatigue, distraction or another type of recklessness was involved in the crash. One of the biggest Portland, ME news stories involving a taxi in recent years was the September 2013 crash of a water taxi and 20-foot recreational boat in the Portland Harbor. Six passengers – including U.S. Rep Chellie Pingree and her husband Donald Sussman – were returning from a wedding when the captain screamed and the water taxi violently lurched into port. Three of the passengers suffered trauma, bruises and cuts on the head during the incident. Drug and alcohol tests came back negative, but investigators are looking into other factors that may have been caused by driver negligence. “Part of the determination is whether or not (the two boats) were using the proper lights and had the proper safety equipment aboard,” said Scott McCann of Coast Guard Sector Northern New England in South Portland. In another recent case, a taxi driver carrying four passengers returning from a bachelorette party crashed into the SUV of a family visiting from Quebec and caused five other collisions that shut down the I-295 North for 90 minutes. A passenger in the SUV was treated for non-life-threatening leg injuries and a construction worker hit by the cab complained of back pain but did not seek immediate medical attention. The taxi driver, Abdi Egeh of Lewiston, was charged with failing to obey lane controls in the construction zone. The trooper on the scene said Egeh could also face charges of driving to endanger. 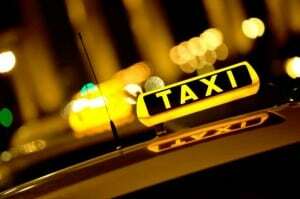 Need representation for a Maine taxi accident lawsuit? The taxi accident attorneys at Hardy, Wolf & Downing bring over 35 years of trial experience to the table. Our experienced litigators come from attorney general, federal court system and Department of Justice backgrounds, which gives us expansive legal contacts and a valuable understanding of the law inside-and-out that can aid in handling your case. Other lawyers may accept a quick settlement offer just to close the case up as another “success,” but we feel that success is only defined by securing you the maximum compensation the law affords your circumstances. We’ll work tirelessly until justice has been served and we have the track record of investigating, preparing and trying Maine car accident lawsuits in court to prove it. Call our Maine taxi accident lawyers at 1-800-INJURED for a free consultation. You only pay for our legal services if we take your case and win.